Contact angle is a simple and yet powerful tool for characterizing three-phase junctions. The technique of the sessile drop is today the most widely used method to measure this parameter. The commercial softwares available today are still very limited. They are often dependant of one measurement setup, and may fail under non-standard conditions. DropSnake is based on B-spline snakes (active contours) to shape the drop. These methods have been implemented as a Java plug-in for the ImageJ software and we make it freely available. See the "free software" section to download. A.F. 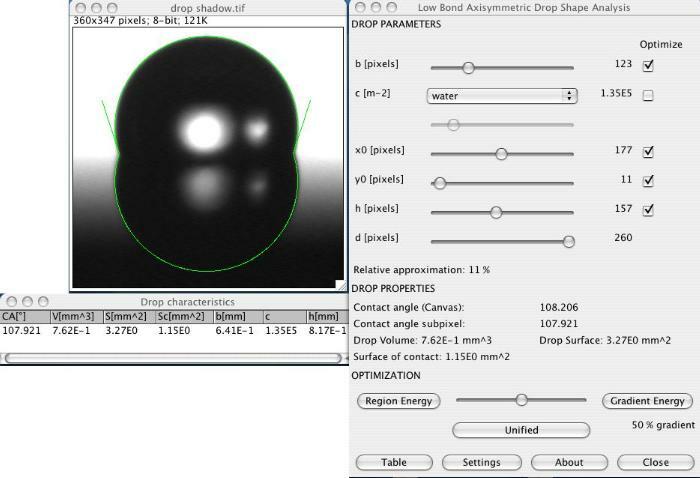 Stalder, T. Melchior, M. Müller, D. Sage, T. Blu, M. Unser, "Low-Bond Axisymmetric Drop Shape Analysis for Surface Tension and Contact Angle Measurements of Sessile Drops," Colloids and Surfaces A: Physicochemical and Engineering Aspects, vol. 364, no. 1-3, pp. 72-81, July 20, 2010. A.F. 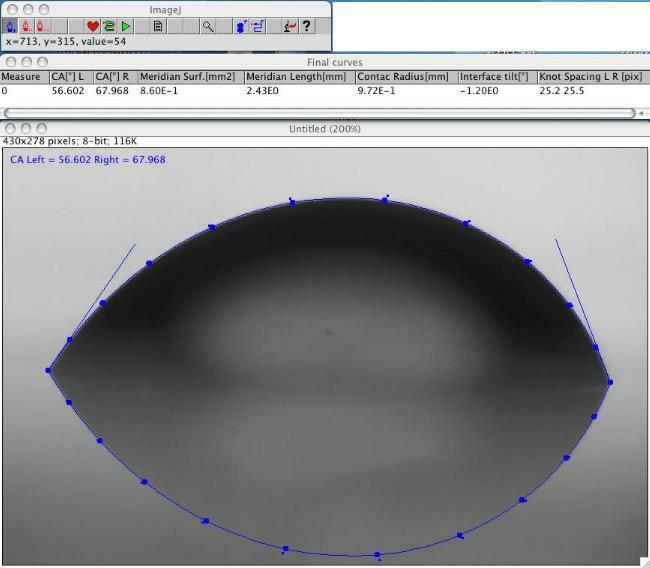 Stalder, G. Kulik, D. Sage, L. Barbieri, P. Hoffmann, "A Snake-Based Approach to Accurate Determination of Both Contact Points and Contact Angles," Colloids And Surfaces A: Physicochemical And Engineering Aspects, vol. 286, no. 1-3, pp. 92-103, September 2006. 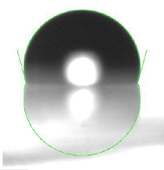 Interface detection: Considering that the interface position is a crucial parameter when measuring contact angle, the drop reflection has been integrated into the drop model, so that to detect the interface position. Interpolated gradient-based energy: In order to provide high precision contact angle on a wide range of images, a drop detection method based on image gradient energy and cubic spline interpolation has been used. Based on this framework, two complementary drop models have been designed. B-Spline Snake The B-snake approach provides a novel methodology suitable to drops that do not follow a global model. Its new model is based on B-spline snake which in reason of their elasticity unify the aspects of locality of the contact angle to the guidance provided by the global drop contour. With this approach, the whole drop shape is used to provide global information, nevertheless, the contact angle measurement remains local and similar to a polynomial fit. Low Bond Axisymmetric Drop Shape Analysis This model is derived from a first order perturbation solution of the Laplace equation for axisymmetric drops. Using this global model of a drop, contact angles are obtained considering the whole drop profile. While offering a fair domain of application, this approximation is computationally much more efficient than a solution obtained from numerical integration (ADSA approach). The software is based on a plugin for ImageJ, a general purpose free image-processing package. ImageJ has a public domain licence; it runs on several plateforms: Unix, Linux, Windows, Mac OS 9 and Mac OS X. Get a copy of ImageJ. and download the plugin drop_analysis.zip. Extract drop_analysis.zip in the "plugins" folder of ImageJ. All the files should extract in a new folder "drop_analysis". The whole process should not take more than a couple of minutes. Open a drop image. Ensure that the image is grayscale. In the "plugin" menu, go under "drop_analysis" and choose one of the two methods: "LB_ADSA" or "DropSnake". You are free to use this software for research purposes, but you should not redistribute it without our consent. In addition, we expect you to include adequate citation whenever you present or publish results that are based on it. Thanks to Laura Barbieri and to Marco Brugnara for the images.